Keep your existing Panacea landscape edging securely in place using these Panacea Black Metal Landscape Edging Stakes. This set of three lasting, steel stakes helps keep one section of your existing, Panacea metal landscape edging (not included) upright and in place. The unique, toothed design of these stakes connects one piece of edging to another without requiring the edging to overlap, and one may be placed in the center of the border for extra support. The black, powder coated finish matches with the edging, and the pointed bottom of each piece is simple to insert into soil. Easily and neatly install your existing Panacea landscape edging using these Black Metal Landscape Edging Stakes. 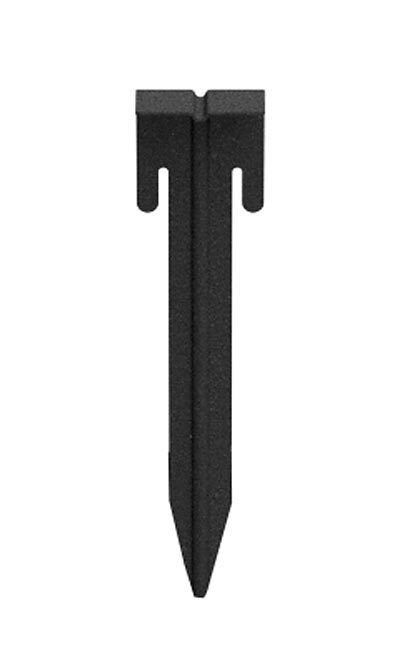 Note: This package includes 3 of the Panacea Metal Landscape Edging Stakes, Black.